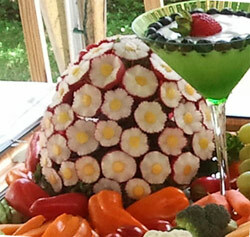 Flower vegetable and fruit arrangements are an eye catching and colorful way to serve fruits and veggies. They make beautiful centerpieces, too. You can have fun, create “WOW”s and save quite a bit of cash by making fruit arrangements yourself. They are really quite easy to do once you know how. And, your arrangements will get plenty of attention when you bring them to parties. Fruit arrangements are often made with a variety of fruits and sometimes those fruits are chocolate covered. For more variety, you can make your edible bouquets with dried fruits, chocolate covered dried fruits and even vegetables. To get a instant access to a showing you how to make a pretty flower bouquet from radishes, sign in to for your free lesson at the top right hand section of this page. Wait a minute – you might say, “But I don’t want to make a radish bouquet, I want to make a bouquet of fruit.” Well, the same techniques taught in my free lesson can be used to make gorgeous , colorful fruit bouquets that stand out from the ordinary cookie cutter fruit bouquets. Look at the beautiful fruit bouquet that one of my customer/students Najlaa-Al-Sayigh made. It is pictured below. Najlaa took the same techniques as taught in the free radish flower bouquet lesson and applied them to strawberries, kiwis, grapes and more. She experimented with different kinds of centers. And look as the results – A really beautiful edible bouquet. With the simple instructions in my free video lesson, imagine the colorful arrangements that YOU can create for your next dinner, brunch or potluck party. Here is what a few other students have had to say about my free lesson showing how to make a pretty radish bouquet. Thank you so much for the video. I made the bouquet for a friends baby shower and everyone loved it. They thought it was professionally made or store bought. Thank you for the lesson. My fruit and veggie appetizers display turned out awesome. No one could believe it was my first one. I have done smaller fruit bouquets but nothing on this scale. The watermelon and Radish bouquets were the favorites. It was a big hit at the wedding in my back yard. I did get the tools on Friday. for Your Fruit Arrangements that are Edible. 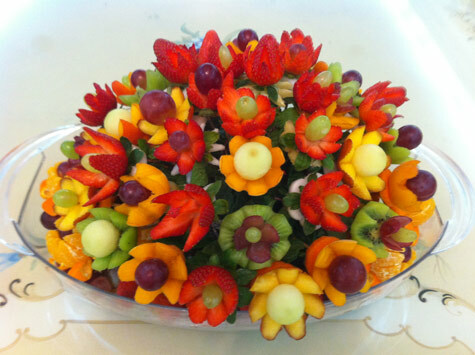 Fruit bouquet arrangements can include chocolate dipped strawberries and other fruits. These can also be very easy to make yourself at home. The following video will show you how easily you can make chocolate dipped strawberries. And, you can use the same technique to make chocolate dipped dried fruits as well. For white candy coated strawberries, use white chocolate chips, white candy morsels or white candy coating. You can find white candy coating for your edible fruit arrangements at craft stores like Michael’s, cooking stores or cake decoration supply stores. Candy coating come in a variety of colors, so you can candy coat the fruit in your edible bouquets with whatever colors are fitting for your event. “It is wonderful! You were right…I did get ooohs and aahhhs with my family. To take it one step further, you can decorate your chocolate dipped strawberries without any special tools. See how in this quick video below. Another way to decorate your chocolate dipped strawberries for your arrangements is to dust them with colorful candy sprinkles. Edible Bouquets can be made from many types of fruits and vegetables. Edible bouquets can be made in many different styles, large or small, with different kinds of vases. You can make a vase from melons or squash or you can even make edible bouquet arrangements with vegetables accented with carved vegetable flowers. You can learn how to make several different types of fruit and vegetable bouquets in my 11 Week Vegetable and Fruit Carving 101 Video Course for Beginners. Fruit arrangements that are edible can be a beautiful and fun addition to any party. Bring them to a potluck and you will be the recipient of ooohs, aaaaahhhs and compliments. They can be a real conversation starter. “I am so surprised at how easy you make it look. I always think I couldn’t do that then I listen to you and suddenly it all seems so easy. Your free videos are brilliant. I hope you have found these ideas useful. To see exactly how, step-by-step to make a lovely vegetable arrangement from radishes, (remember that the same techniques can be used to make a strikingly colorful fruit bouquet), sign in for my free lesson at the top of this page. Have fun making your own do-it-yourself vegetable bouquets and fruit arrangements that are edible!